When our daughter took piano lessons with Nancy, I would sit and wait in the living room of her big old house, along with our young son. We had an hour together. An hour that didn’t have the distraction of home; laundry, homework, and preparing dinner. Nancy’s house was full of turn-of-the-century furniture and artifacts, including a harp. It was a wonder, especially to the eyes of a six year old boy. Nancy had a television, and we were allowed to turn it on. During those piano lessons, Mister Rogers Neighborhood was on TV. This was different, because we weren’t watching it at home with distractions. We were a captive audience. Watching Mister Rogers was like being at the movie theater. Really. We did this every week, together, for two years. He certainly made an impact. Every show was familiar, yet new and exciting. This became our favorite TV show to watch together. That was over thirty years ago. Today, I know Mister Rogers made a difference. He profoundly influenced my teaching. And, our son is a kind father with a big heart and positive attitude. Piano lessons were an hour long. After a thirty minute Mister Rogers Neighborhood on TV, we read books. My strongest memory is reading aloud The Velveteen Rabbit. I had never read this book as a child, so reading the story to my son was a shared experience. It was wonderful. When a classic book is still popular, there’s a good reason. I discovered that. This book has all the elements that really mean what is most important; childhood fear, worry, friendship, struggle, bravery, understanding, acceptance, and love. I’m a teacher who reads aloud every day, and I can attest that few books reach the depths of the most human experiences. The Velveteen Rabbit does. We worried and cried and cheered together. We asked a hundred questions. Being in Nancy’s big old house for two years was far more than piano lessons. Sharing Mister Rogers and many good books was the pinnacle. This entry was posted in books, children's books, Early Education, Expressing words and feelings, Giving thanks, Imagination, Inspiration, Kindness, Love, reading aloud, Teaching young children and tagged children's books, Early Education, Kindness, Making a Difference, Mister Rogers, reading books to children, teaching young children, The Velveteen Rabbit. Bookmark the permalink. We all miss the kind and gentle Mr. Rogers. There need to be more shows and parents like him. You have such wonderful memories with your children. I’m sure they appreciate how they were brought up. I don;t know the show, but I love the book…one of the first I bought for my granddaughter. You made a great choice! How was the school play? Wonderful! A room full of pre-schoolers, in five sets of ethnic dress (Hollie was Indian), singing and dancing to the traditional songs of those countries, greeting us and counting in five different languages… (which made a few things come clear for my son having wondered exactly what Hollie had been talking about these past few weeks. 😀 ). Some wonderful craft work too. Children are sponges. This is terrific! He sounds like a remarkable man. We need more like him. Books are the essence of civilisation. He is a fine man. His entire family are voracious readers, too. Such fond memories of precious and valuable time spent with your young son. I wonder how many parents would do something like that now? I don’t think as many parents would do that now. The stress of working families is having an enormous impact on children, and they can’t seem to stop and be in the moment with their child. The pleasures of reading a book together make such a big difference. Best to you, Pete. I would sit with my kids and Mr. Rogers. We always had a good time and certain phrases worked their way into our family lexicon. “Correct as usual, King Friday,” was a favorite. Nice memories, Jennie. Thank you, John. His memories are some of the best. What a wonderful memory for you and your son. My life was so crazy hectic when my children were growing up that any amount of time together was so precious. And time to read even better! This is an excellent post about acquiring good values, Jennie! This is a great memory, Jennie. Thanks for sharing it with us. 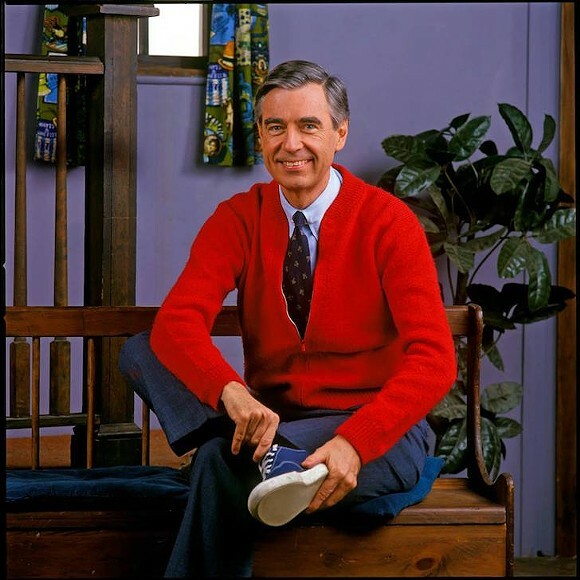 Mr. Rogers is a standard by which kids television should be measured. He proved that a caring adult can deal with any situation in a child’s life, with love and kindness and facts, even if the facts are scary. Well said, Dan, and so true. Thank you. I enjoyed watching Mr. Rogers when my children were young. He exemplified all that we hoped to teach our children, unlike most of the cartoons that were available. I miss him. He truly made an impact on our children and most others as well. Yes! He made a deep impression on children, and adults, too. He was a hero. Like you, I miss him dearly. I wish this generation had a Mister Rogers. Thank you! Thanks for the peek into your special times with your son! I love that word, Laura. It’s perfect. He really did make learning and growing feel good. Thanks so much! A lovely memory of this time with your son, Jennie. When Michael was three, Gregory also had piano lessons and I used to take Mike with to the lesson. We would do puzzles and walk around and look at the trees, flowers and leaves and even collect acorns. Those are wonderful times. I’m so glad you had the same experience with Michael. We were lucky, Robbie. The Velveteen rabbit-and Mr Rogers- make me sigh. Two of my favorites. Mister Rogers and The Velveteen Rabbit make for the best memories! This is a beautiful memory and reminded me of the countless (wonderful) hours spent reading with my son. We watched lots of tv over the years as well but the quiet, snuggled up moments of reading will always be my favorite memories. That is so nice. Thank you for your kind words! If my post can bring peace and calmness, well that’s as good as it gets. Aren’t memories wonderful? Those snuggled up moments are the best. Thanks, Debby. Yes, we could certainly use a new Mister Rogers! I didn’t watch his shows growing up but I know why you meant by having memories of old shows. We need more shows like Mr Roger’s for children and not the violence cartoons. Aww, so glad you had this time with your son. Lately, my son has mentioned he liked our 15th year of his life when we went together to a family psychologist, I ate out with him, we went bowling, played darts and took moments to “be together.” My last husband was tough on him, for which I felt caught once I realized he was so controlling of us. I am glad Jamie thinks about our weekly effort to “save” him. It felt good to share this with you, Jennie. My ex is long gone but he scarred my son (not physical, but emotional commenting. I didn’t realize until we had our year with Dr. Michael (Miguel) Hernandez. We re-built our relationship and it helps him to be a better parent/Daddy.